Starting from the very beginning of my day…I am using these plant gifts to get it started right! -Brush my teeth with OnGuard Whitening toothpaste. We love ALL things OnGuard…including the foaming hand wash soap + refills. Now, the OnGuard floss, OnGuard throat drops, OnGuard cleaner concentrate, and OnGuard + soft gels if we aren’t feeling 100%! -Diffuse Elevation Joyful blend or any citrus oils/peppermint to wake up!! -WHEN I get a chance to take a shower: I use a TON of doTERRA products! I use the shampoo and condition with Wild Orange + Lime oil. Smells delicious! Then when I get out of the shower I use the smoothing serum and the healthy hold glaze before I style my hair (most days I air dry it and it looks/smells great!) plus the amazing body wash! -I use doterra’s natural deodorant and love it! -To start my day out right I apply either Cheer Uplifting blend, Elevation Joyful blend, and InTune Focus blends! My natural purefumes! If if we do get bit by bugs we use the lavender or melaleuca (tea tree) touch rollers for minor owies as well. We love the correct-x essential ointment. I use these Touch pre-diluted rollers for various situations that come up…see below. – I continue to diffuse throughout the day…depending on moods, energy, etc. -my Lifelong Vitality multivitamins and other supplements with food at lunch time or around there. Perfect for an energy boost in the middle of the day! -The kids take their multivitamins, probiotics, and fish oils as well daily! A new probiotic formulated just for kids! Dr. Parker tested this on his 5 children and they got the flavor just right. 🍉🍓They used European technology for the encapsulation process to protect the live cells from your stomach acid, giving your children the most benefits! – 30 sachets per box. – Sugar free! No artificial colors or flavors! – Delicious strawberry/melon flavor🍉🍓 I love the taste! -Each probiotic strain is micro- encapsulated using a new technology, which gently wraps each live bacteria cell so that your body is able to receive all of them. Happy gut makes for a healthy life! Can’t wait until these are officially out in October 3rd so I can stock up!! -diffusing Serenity Restful blend in all the rooms at nap and bed time – 30 minutes before bed to set the tone. Dab on their PJ’s, stuffed animals, and sheets. I apply to my feet every night to calm my mind and get better quality sleep! Every day, I clean with essential oils especially the On Guard cleaner concentrate. Love it! Affordable and natural for your babies and 4-legged babies. SO as you can see…I use these oils and products for everything to help keep my household running smoothly and this is just the tip of the iceberg. I just wanted to give you an example of how I use them everyday! 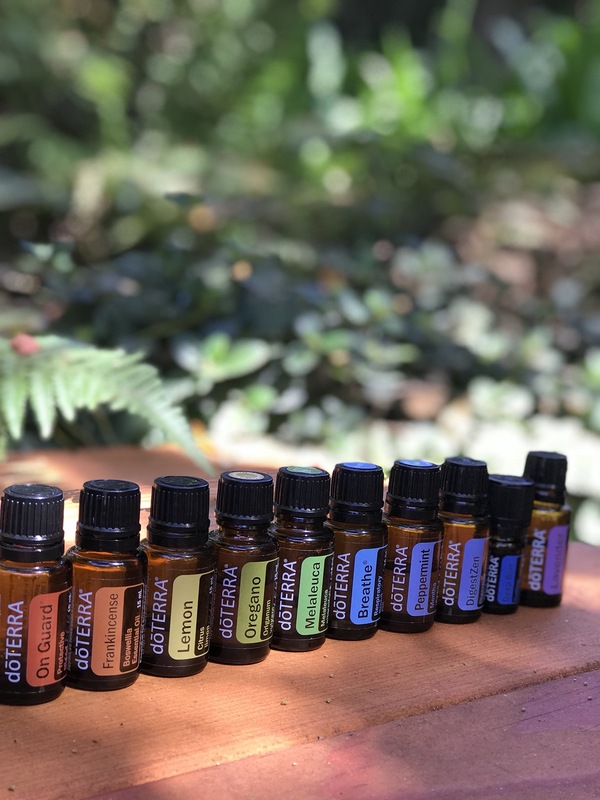 You can get started here – these are popular bundles to give you a variety of oils to be able to make your own rollers, diffuse, and care for you & your family! Click the hyperlinks below to read more on each one! or we can discuss an oil plan for you to just purchase a couple of important oils. Whatever works! I hope to talk with you soon! Oil Fam Essentials : Bathroom Cabinet Makeover!